I really liked this book! I thought it was funny, well written and I really liked the characters, however I just didn’t love it. This was one of my most anticipated series of 2017. So my expectations were through the roof. Unfortunately my expectations were not met. I had a few issues with this book and it definitely prevented me from enjoying it’s full potential. This book is a debut novel and for a debut it’s incredible. Sebastian is a very talented author & his writing was my favourite part of this book. His fight scenes are amazing & the banter between the characters had me in tears from laughter. The writing is a mix between Scott Lynch & Joe Abercrombie. I normally love basic writing however I felt the writing was abit too basic with this novel. There wasn’t enough world building & I didn’t know what majority of the characters looked like due to lack of descriptions. BUT the fight scenes definitely were not lacking, this book has some of the best described fights I’ve ever read. I felt like I was there watching half of the fights. ‘Sure,’ I said. ‘We teach them the first rule of the sword.’ One of the guards, the one closest to Kest, tightened his grip on his pike in preparation for the attack and said jeeringly, ‘And what’s that supposed to be tatter-cloak? Lay down and die like the traitors you are?’ ‘No,’ Kest said. ‘The first rule of the sword is–‘ His words were cut off as the guard jabbed his pike with the speed of a metal ball flying from the end of a pistol. ‘– put the pointy end into the other man,’ Kest finished. 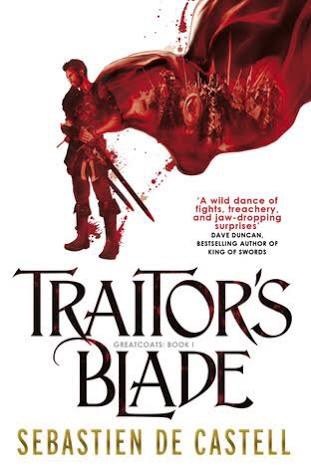 The story follows Falcio who is the first Cantor of the Greatcoats, the greatcoats are basically the Kings own judges, trained for battle aswell as politics. The King is killed by one of the Dukes & the Greatcoats are now scattered & marked as traitors ‘tatter-cloaks’. The Greatcoats must reunite and bring peace to the nation of Tristia once again. Falcio is an extremely interesting character he has a dark past & he goes into ‘berserker mode’ so I enjoyed reading from his POV. I can’t say much about the other characters because they didn’t get enough page space but they seemed equally amazing. This book started so strong, I loved the start so much. After the greatcoats split up around the middle my interest in the story declined and everything went down hill from there for me. As much as I like Falcio. I didn’t enjoy his solo time, I was bored out of my brains. I missed the fuckery so much, so when the crew finally met back up again, my interest was piqued again but that was sort lived due to the ending. There was nothing new or mind blowing, don’t get me wrong it had plot twists you never saw coming but even some of them fell flat for me. So my salty old friend it was an okay read for me. The story itself is written in first person narrative, which I normally hate, but I felt it really suited this story, plus it was set in past/present tense so it was more tolerable for me. The writing like I said before is sensational, I love the way Falcio thinks during a fight, adding up the pros & cons of what his next move shall be. I found it super realistic. I JUST LOVED THE WRITING, OKAY?! it was so humorous and filled my tainted little black heart with joy. A few other issues I had with the book, as much as I loved the fight scenes, some of the ones in this book felt kinda random.. For example greatcoats are traveling with caravan, stops for one minutes rest, *hears sound*, bad guys everywhere and a fight breaks out.. Like how many bandits and bad guys are actually just randomly traveling through a huge forest near each other? I personally found it kinda annoying, it just made the story feel abit choppy. Also I don’t understand how they would just randomly run into the ‘villain’ and nothing happened?! Gah, my poor brain, can’t handle the mind fuckery. Another thing my brain couldn’t handle was that ending.. It was horrible.. Sorry unpopular opinion time but what the actual heck?! I hate when major things happen in the background with no details, like I get the impression the author was in a rush towards the end, so many unanswered questions and it fall flat for me. One more thing, I know, I’m sorry but this is a sword & sorcery book, there’s was very little sorcery and I would have liked to have found out more about the magic system, obviously I will in book two but I was just excited about it & got none. This could be considered a minor spoiler there was an act of animal torture that had me gritting my teeth & I may or may not have shed a tear or two. But it did serve a huge purpose in the plot & I’m happy with how the issue was resolved in the story. Honestly this is a great debut novel and I’m sure everyone who reads it will enjoy it. This is a story of friendship, heartbreak, honour, badassery & trust. So a heartwarming nice read. Looking forward to completing the series and can’t wait for it to get ‘grimdark’. Recommended to all fantasy lovers over the age of 15, due to the amount of violence. Loved your review. I’m looking forward to starting the next one 😆 if you loved the writing, it’s so similar to the Ciaphas Cain novels in the Warhammer 40k universe. Or thd Flashman papers (hilarious historical fiction). Nice to see a fellow fantasy nut!